Using Italian ingredients makes for a delectable meal, and pasta orecchiette is no exception. Orecchiette according to Recipes Wikia, is a pasta typical of the Apulia (Italian: Puglia) region of Southern Italy. 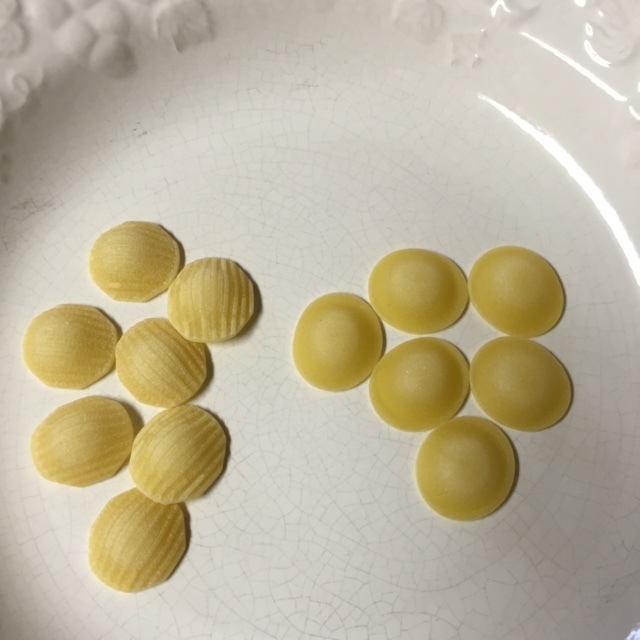 The shape of the pasta is what gives it, its name. 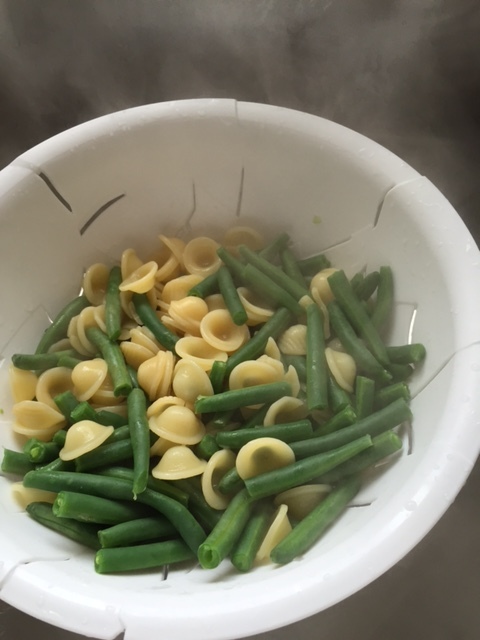 The pasta resembles a small ear. In Italian, the word “orecchio” means “ear”, and the suffix ‘etto’ means ‘small’. The pronunciation of Orecchiette is : ohr-ay-KYEHT-ee. In another article we noted that Andouille Sausage is thanks to French cuisine. The sausage is double smoked pork, that is once the meat is prepared it is smoked, then put into a sausage casing and smoked again. Our featured recipe is actually a mix of two pasta recipes, which are Pesto Orecchiette with Chicken Sausage and Gluten Free Creamy Pesto Fettuccine (click links to view recipes). 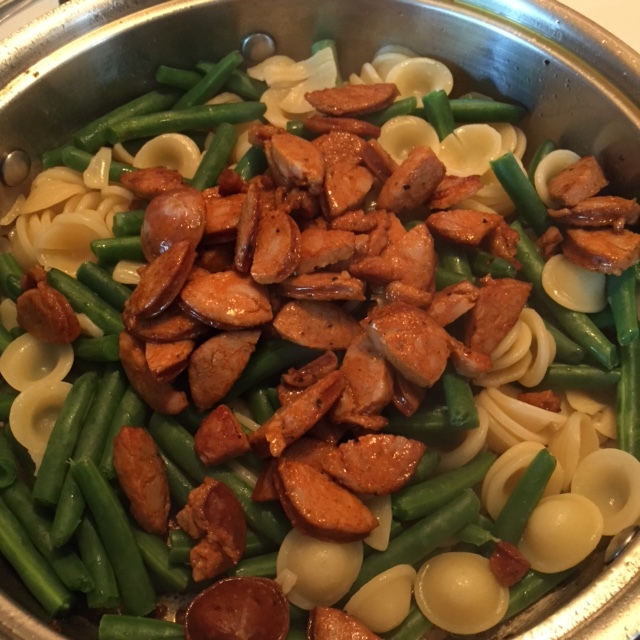 Now for our featured recipe Orecchiette with Andouille Sausage and Pesto Chipotle Sauce, and here is what you will need. Prepare basil pesto, and add the 2 teaspoons of adobe sauce to one cup of the pesto (get ingredients by following link above). Or if you are using your favorite store bought brand (preferably in a jar) remove one cup and mix in the adobe sauce. Set prepared pesto aside. If you have any left over basil pesto sauce, store in a glass jar and pour a thin layer of olive oil over top of pesto to keep it from browning, and place a lid on jar and tighten. The pesto should keep in cooler for 7 to 10 days. Pesto sauce makes a great spread for sandwiches as well. 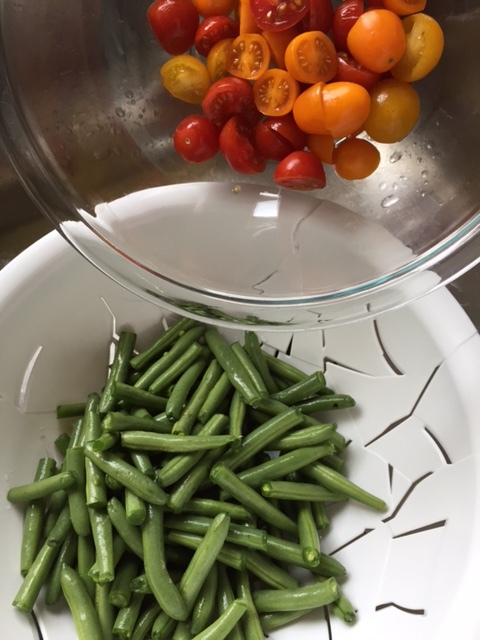 Prepare green beans and symphony of cherry tomatoes and set aside. Cook pasta according to package instructions. 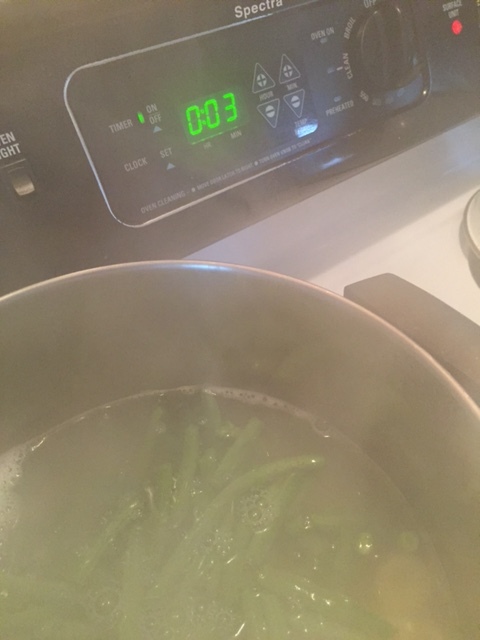 Last three minutes of cooking time for pasta, add prepared green beans. Drain, but do not rinse. Set aside. Slice sausage into 1/2 inch slices. Heat a large skillet over medium heat, add a tablespoon of olive oil, add meat and move about until heated through, about 5 minutes. Remove from pan. 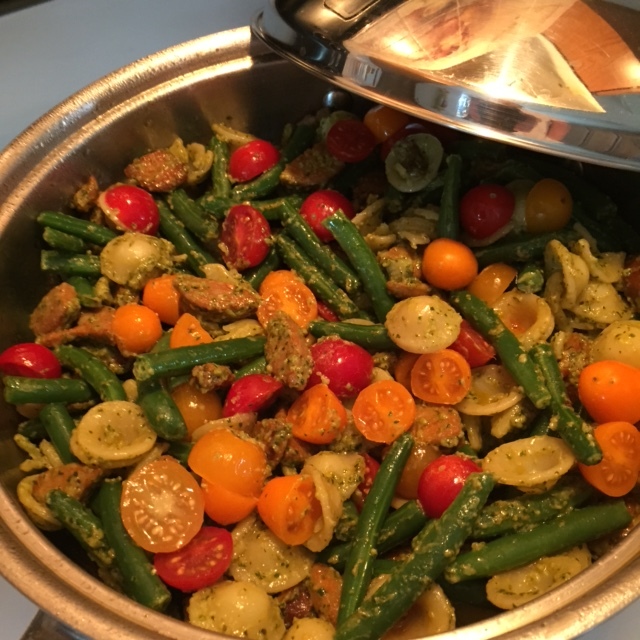 In the same large skillet, add the pasta green bean mix, the cup of pesto, sausage, and mix until coated with pesto chipotle sauce. This entry was posted in Main Dish, Pasta, Pork and tagged Americas, Andouille sausage, Apulia, Basil-Lemon Pesto, Egg white, European Union, France, French language, Hong Kong, Italian American, Italian Classics (Best Recipe), Italian cuisine, Italians, Italy, Mashed potato, Olive, Olive oil, Orecchiette, pasta recipes, pesto sauce. Bookmark the permalink.